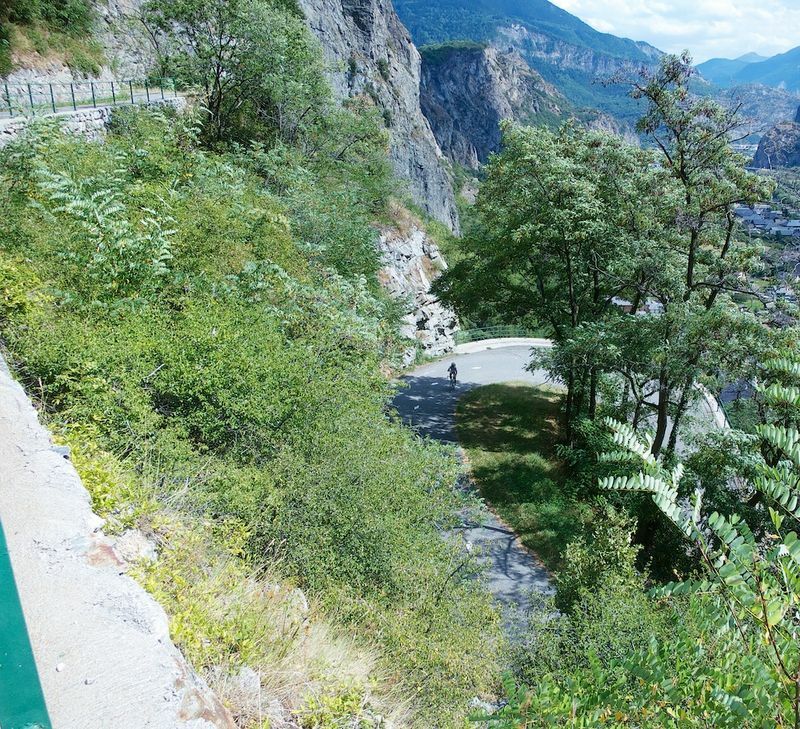 Driving on the French A43 Autoroute towards Torino, if you know where to look – and you need to know where to look – you will see the most amazing little road crawling up a cliff. These are the Lacets de Montvernier. For details of the road above Les Lacets to Col du Chaussy and Col de la Madeleine see here. They are probably the most talked about addition to the 2015 Tour de France route (stage 18) – they will also appear in the 2015 Critérium du Dauphiné. Finished in 1934 after six years of construction, this astounding feat of engineering linked the little village of Montvernier, high above on a plateau, with civilisation below. Lacets means hairpins (think shoes laces). There are 17 hairpins (lots of publications say 18, but one is questionable and off in its own #hairpinpolice). 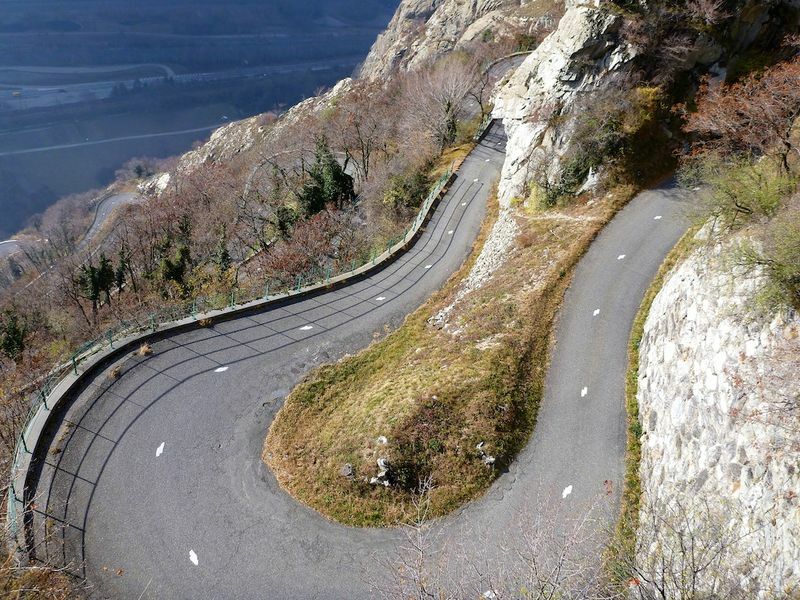 The 17 hairpins all come in a stretch of roughly 2.5 kilometres. 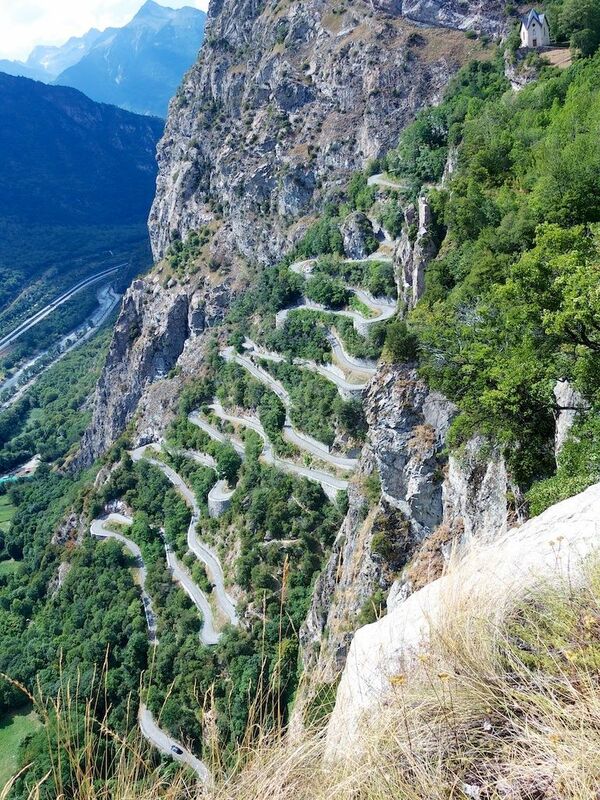 That’s a hairpin every 150 metres. The road is narrow, the hairpins sharp, and large vehicles are forbidden. It’s a steady incline, roughly 8% average. Perched just above the hairpins is the Chapelle Notre-Dame-de-la-Balme. Hexagonally shaped, it was built in 1863 and renovated in 1981. 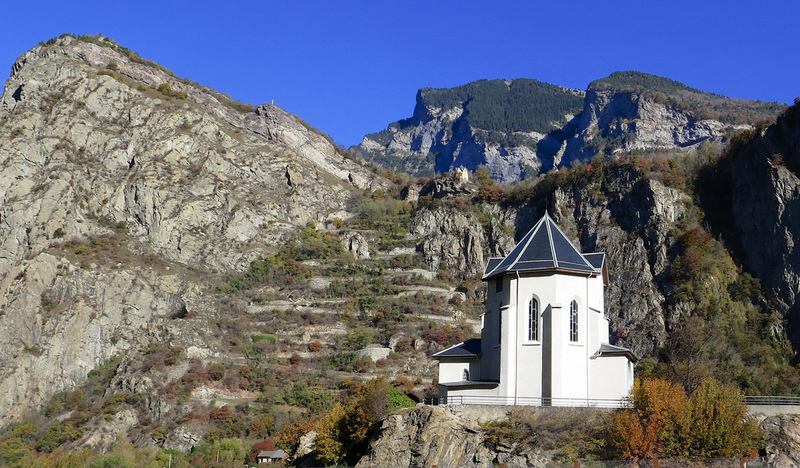 There is a similar little chapel down below (now next to the autoroute). 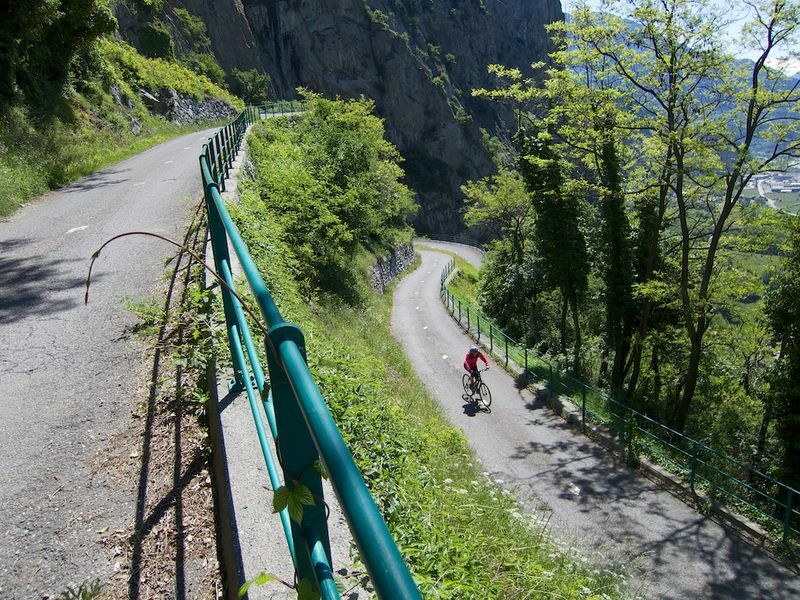 Les Lacets de Montvernier are situated in the heart of the Maurienne valley, a true cycling Mecca, home to arguably five of the ten most famous climbs in France — Galibier, Iseran, Madeleine, Glandon, Croix de Fer — and many other huge but lesser known gems. Zoom the map below, the bright red road under the bright red star is Les Lacets. It is tiny compared to the surrounding climbs. 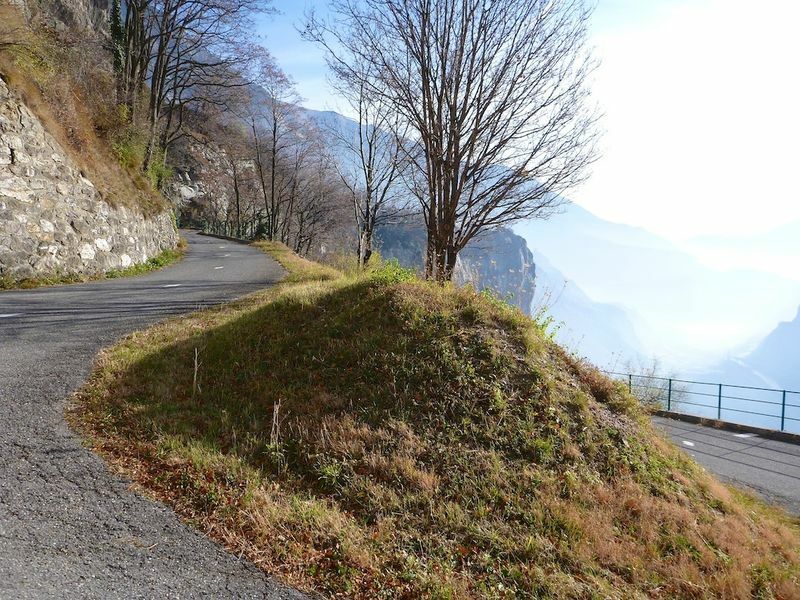 I have highlighted several climbs that will also appear in the 2015 Tour, either the same day as Les Lacets or the following day. I won’t go into any detail in this article, but wanted to give a feel for this superb cycling region. Pink = Col du Chaussy. Basically Les Lacets are the first 20% if this great climb. Purple = Col de la Croix de Fer. Huge climb with 5 ways up. Pale blue = La Toussuire. Will host stage 19 finish. Also was the finish when Landis bonked (day before his miracle). Blue = Col de la Madeleine. Not in 2015 Tour but a nearby giant. 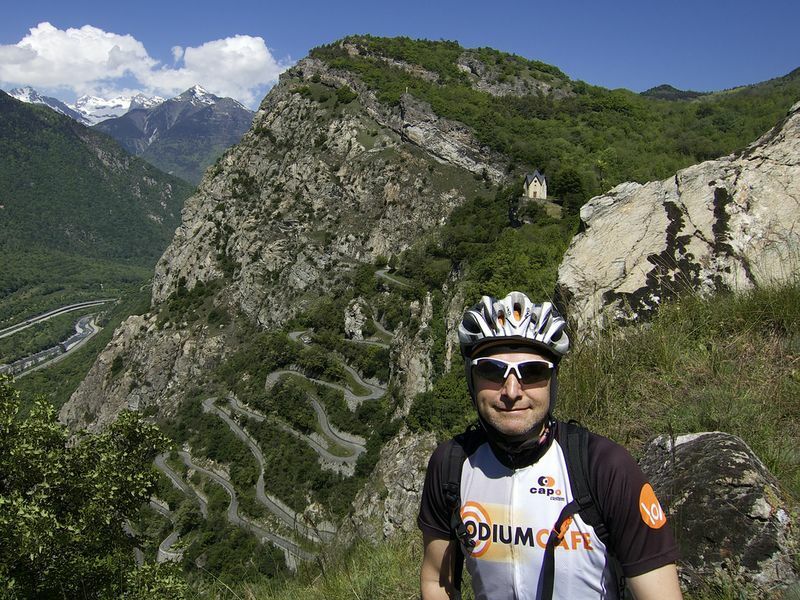 Climb Col du Glandon, descend Col de la Croix de Fer, and visit the Lacets as you ride back to start in valley floor. Or do in reverse. Start with Les Lacets and continue to Col du Chaussy. The far side of Chaussy has been paved in recent years, so descend it and you have a loop. Bring thicker tires. Start with Les Lacets, continue to Col du Chaussy, then continue higher on an unpaved, fantastic road past Lac de Loup (Wolf Lake) all the way up to Col de la Madeleine. Descend Madeleine. Bob’s Your Uncle. 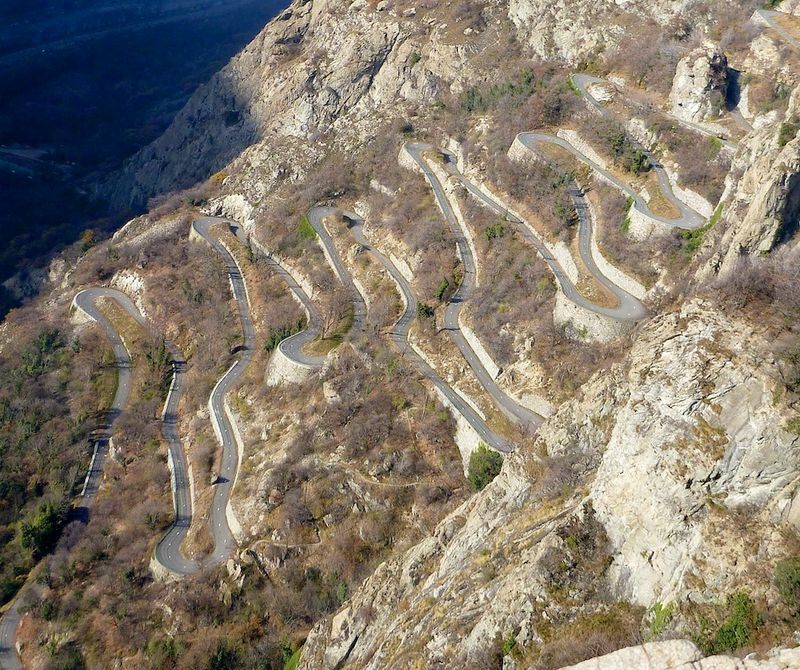 Les Lacets de Montvernier are fun. But they are just a little frosting on the gigantic cake that is the Maurienne Valley. So visit for the big climbs, but enjoy the brief detour up this unique road. Spero que sia possibile per me di visitare quel regione l’anno prossimo. La salita a Zoncolan è certamente famosa. Non conosco ancora le altre dunque grazie per le idee. First of all I must say that the place is really amazing to travel with cycle. I definitely want to climbs there and enjoy the brief detour up this unique road. Hi Will Our last trip to the Alpes and the climbs were in most part made after reading your blog and I must say we had a great time. We would never had ridden Granon or Agnel if we had not seen your great blog. This year we are back and will be in Grenoble for TdF Stages 18-20. We were thinking Col de la Morte for 18, Glandon, Croix de Fer for 19 (coming up from La Chambe) and of course Heuz for 20. That all makes perfect sense. For stage 19, a great viewing point is on the hill a few metres above the last hairpin before Glandon. You can see all the hairpins below, beautiful spot. And yes, stay away from Les Lacets that day. I doubt they’ll let people on them, and it is near impossible to view them except from a few cliff look-outs. Madness. Enjoy (I may possibly be on Glandon that day too). Been a long time since you wrote this, but I’m hoping you could still help out: what’s the condition of the road up to Lac de Loup? Do you need a trail bike, or could it be ridden on a cross bike or even something like a Roubaix with 28mm or bigger tires? the road is OK up to Lac de Loup. But the stretch beyond that links to Col de la Madeleine gets very rough. I know people that have taken a road bike. But it’s really too rough for one,. Awesome, thanks! Starting to plan my 40th birthday trip (still have a few years though – I’m just excited!) and don’t really want to do one of those big group tours. I regularly ride my “endurance” road bike w/28s on gravel & dirt forestry roads, but I didn’t want to plan to ride up there only to be confronted w baby heads the whole way. Really appreciate it – thanks again.